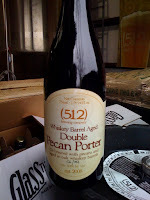 (512) Brewing has just released their Whiskey Barrel Aged Double Pecan Porter in bottles. Previously only available on draft, this is the first beer from (512) that has been bottled. This is a bigger, bolder version of our mainstay Pecan Porter, with a richer finish. Two months on recently emptied Jack Daniels select barrels imparted a wonderful vanilla character from the oak and a pleasant amount of whiskey nose and flavor. Only 187 of these 750ml bottles are being released to local stores around Austin, so they won't last long.